When it comes to jewelry, the most precious merchandise a retailer can display, presentation is of utmost importance. 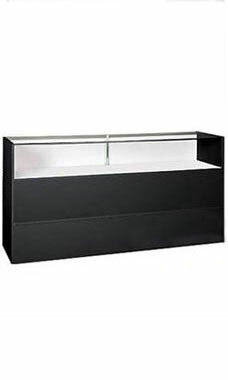 The black jewelry display case from Store Supply Warehouse is a modern classic that will not only present your jewelry in its best fashion, but will give you years of affordable elegance and dependability. It offers a number of features, including black low pressure melamine laminate finish to match the rest of our black display case collection. It also uses a tempered glass top, front, and sides, so that your potential customers can view every aspect of the jewelry they are purchasing. Additional features include white sliding rear doors and concealed rear storage area for store essentials or personal goods. Optional features include a lock and light kit. The glass display area measures 12" in height. Overall measurements of the entire jewelry display case measures 38"H x 18"D x 70"L. Ready to assemble and available for immediate shipment. These are all I will buy for my business. The directions arent very clear for assembly, but they go together easily and look great! Very well built! Assembly went off without any issues. clear concise instructions and once assembled were very solid.Plenty of under display storage.